I found it! Well, it was found. That’s a better way of putting it. Well, my roommate was at the local used-book store and grabbed me a small stack of promising reads, one of which was that very book! He wasn’t even thinking of the previous review when he saw it, he just thought that it looked ridiculous enough to review. And he was right. He was double right! For those who don’t feel like going back to read the previous review, here’s a bit of a recap. Earth’s dimensional twin, Annwn, is a world where there is magic. It is possible to go back and forth between the worlds via some kind of magical gate, and this is the kind of thing that happens enough that it’s not all that remarkable to the people of Annwn. Our hero, Dylan MacBride, is a fantasy Scotsman, and he’s engaged to Clarinda, a fantasy Irishwoman and priestess of Keridwen. This gives her magical powers. This book starts with Dylan being invited to test out a new submersible sea vessel, the Thunderbolt. Annwn’s technology is a bit behind that of Earth’s, but it seems that all this doesn’t take place during the present day anyway, so really they line up a lot more than you’d think. Anyway, Dylan’s experiences on the Thunderbolt almost end in tragedy when it turns out that the guy who invented and built it is an idiot and the thing almost sinks. It was pretty funny. About this time Dylan meets a mysterious “Dr. W.” Dr. W. is friends with a guy named “Mr. H.” The reason behind their names is given at some point in the book, something to do with maintaining anonymity, but we all know that it’s because George H. Smith found out at some point or another that the Sherlock Holmes stories aren’t in the public domain like people seem to think they are and therefore he couldn’t use their real names. What he can do instead is make it really, really obvious that that’s who they are without ever using their names, and by that I mean we get the phrase “Elementary, my dear X” every ten pages or so. Ugh, that’s the worst part of the book, really. Not just that Holmes and Watson are there in thin disguises, but just the fact that that phrase, which never once appeared in the Arthur Conan Doyle canon, is so overused, like the author expects us all to go “Haha! I get it!” every time it happens. Anyway, the two men tell Dylan that his planet is about to come under attack by Martians from their universe. See, The War of the Worlds (which apparently could be named because it had by that point entered the public domain), was a real thing, it actually happened, and Holmes and Watson were there. I guess they helped out. Odds are Holmes had figured out that microbes were the solution to the problem by page four of the Wells book and saved the day by sniffing some black pepper. Who knows? This kind of merging of fictional universes isn’t new and probably never has been since somebody wrote fanfiction of Gilgamesh and Moses teaming up with Odysseus to fight Grendel. That’s your writer’s prompt for the day! It’s also not new to modern science fiction. Phillip José Farmer’s Wold Newton stories date back to 1972, although I don’t think they were called that at the time. Still, unless it’s clear that that is what the story (and its universe) are all about, it kind of bugs me. The premise we’re given is that Annwn is an alternate Earth. One naturally presumes that this means that it’s an alternate of our Earth, not the Earth of The League of Extraordinary Gentlemen. I suppose that we could argue that the book is treating both The War of the Worlds and the Sherlock Holmes stories as some kind of secret histories of our own world, but that’s pushing it. Anyway, Holmes gives Dylan a copy of The War of the Worlds, which Wells wrote as a nonfiction work, and tells him to get ready, because the Martians are on the way to Annwn via its own analogue of Mars, which is called Thor. It also turns out that this whole deal isn’t the Martians’ idea. It turns out that there are some humans who call themselves the Circle of Life and they believe that the Martians should have won in the first place, basically because of Darwinism. If they’re so much smarter they we are, they reckon, they’re superior evolutionarily, so it’s just blind luck that they lost the first time. Of course, they forget that so much of evolution is just blind luck in the first place, but we can forgive them this mistake because they’re already idiots to begin with. Most of them are the sort of spiritualists and nutjobs that only the Victorians could have provided the world. They’re never called Theosophists but that’s the vibe that I got from them. There’s this one guy named Master Koot Hoomi who fits it all to a tee. He claims to be a Tibetan master of mystical arts and all that, like you’d expect. But the fun thing is that the contingent of these guys that were all frauds back on Earth are now actually magically adept on Annwn, because magic is real there. What these guys found out is that one of the Martians survived the events of Wells’s memoir. They found it and it taught them how to commune with Mars via psychic powers like the Martians themselves do. They learned that the Martians didn’t send down everybody or even as many as they meant to because there was a malfunction in some of their launching devices. The Circle of Life tells them that they might fare better on Annwn because it’s got less technology (although technology wasn’t the thing that beat them in the first place? ), and also they send them the means to create some way of protecting themselves against the germs that killed their attack force the first time (oh, there it is). These guys are such dicks! Oh, and while he never shows up and is never explicitly named, the leader of these folks is described by Mr. H. as “a veritable Napoleon of crime.” Just in case you were wondering. The bulk of the book involves Dylan, Holmes, Watson, and some other folks looking for the Circle of Life’s secret hideout. Clarinda comes along in her own way, mainly via a direct mental line of communication with Dylan. She uses it mostly to yell at him. Yep, she’s still an Irish stereotype in this book. The thing is, whenever there’s a big scrape and it looks like our heroes aren’t going to make it, Clarinda is able to magic up some kind of deus ex machina to save them. It happens again and again. But when it looks like something she’d be able to do would just get rid of the Martians and save the day, she refuses to do it. That also happens again and again. She cites a strict code of conduct that she has to follow as a priestess of Keridwen, for instance, or else she just says that the minds of the Martians are revolting and horrifying to her so she won’t have anything to do with them. It was a bit exasperating, knowing that the only thing that was keeping the book from just ending was this woman’s arbitrarily enforced code of conduct. I can’t tell if it was intentional sexism or not. I’m actually leaning toward the negative, if only because there wasn’t much else sexist to add to that. Our heroes fail to find the camp in time to prevent the Martians from showing up. Come to think of it, I’m not sure what good finding the camp would have done in the first place. Whatever the case may be, the Martians show up after our heroes have been taken prisoner. The crash landings of the Martian pods allow them to escape just in time to see the assembled Circle of Life members gather around one of the Martian pods by way of greeting. As you might expect, the first thing to emerge from the pod is a heat ray that kills them all. Obvious, but satisfying. So now, with about thirty pages left in the novel, our heroes have to fight off the Martians. It starts off poorly. The people of Annwn are hopelessly outmatched. They score a few victories here and there, taking down the occasional Martian tripod or blowing up a pod before the Martian inside it can emerge, but really it looks hopeless. As the clock is ticking down, Dylan manages to find the Thunderbolt, that submersible from the beginning of the book, and make some use of it. The ship was actually brought up to snuff earlier in the book, I just forgot to mention it. Now he’s using it to go underwater where the Martian heat rays can’t hit him. He rams the legs of the tripods and knocks them over. This looks promising until he takes some damage and the ship starts to sink and he almost dies. He survives thanks to Clarinda. She uses her powers to suspend him in a bubble of air and transport him out, sustaining him for three days so that he doesn’t get the bends (a rather nice bit of detail there, actually). She’s tuckered out. The Martians are advancing ever more. Avallon, the city where Dylan and Clarinda live and I just haven’t mentioned by name yet, is overrun and everybody has either fled or is underground. Our heroes are members of that latter group. With ten pages to go, I’m honestly wondering what’s going to happen. I’ve read the sequel, mind you, so I know they’re going to be okay, but I suppose it’s a mark of decent writing to keep me in suspense despite knowing how things turn out. Alternately, it can be a mark of hacky writing where the end just happens and the day is saved on the last page by virtue of something we had no idea would or could happen for multiple reasons. I brought up this possibility because, well, that’s what happens. All the way up to this point I was enjoying the book. Dylan figures the thing he needs to do is blow up some kind of fuel station the Martians have set up. I think I missed the part where they did that. He is accompanied by Philippa, whom I’d not mentioned yet even though she was in the rest of the book because she wasn’t all that useful or important. Earlier she tried to recruit Dylan into the Circle of Life. Her primary virtue is that she’s hot. She wasn’t at the mass vaporization at the other members because of a reason I forgot. At the end of the book she’s trying to atone for her sins, but Dylan basically tells her to get back to base because she’s going to get in the way. I think somehow she manages to make herself useful, but I only really mentioned her because I felt like I had to. Anyway, the ending of the book. Dylan takes some dynamite to this Martian fuel dump. He knows its a suicide run and he mentally says his goodbyes. Just as the explosion happens, though, Clarinda manages to teleport him and Philippa back to base. It turns out that this fuel station had a bunch of uranium in it and it exploded enough that it took out most of the Martians, since most of the Martians on Annwn were assigned to protecting the fuel dump. With only a few Martian tripods left on the planet, they are mopped up handily, and the book ends. That is so lame! Nowhere did we hear that the Martian tripods were nuclear powered, and furthermore, I don’t think wrapping some uranium in dynamite and exploding it will result in a nuclear explosion. I could be wrong about that. Still, it’s a terrible ending to an otherwise decent book. 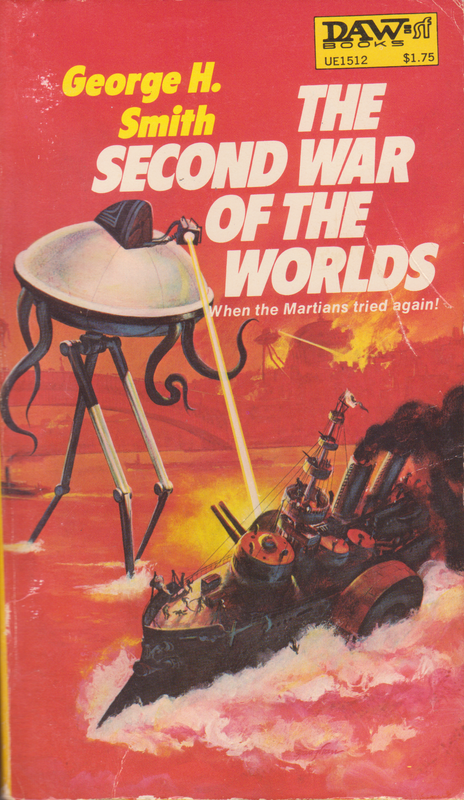 And I know what you’re thinking: Isn’t that appropriate for a pseudo-sequel to The War of the Worlds? I mean, after all, the Martians in Wells’s book were defeated by the common cold or something. I counter that by saying that while Wells had a bit of an anticlimactic ending, his at least had a point. You’ve got these high tech space monsters that succumb to something tiny and basically harmless to us. That’s a decent ending. But when your ending is “I’m going to blow something up and oh wow the explosion was a lot larger than I anticipated” it just feels lazy and boring. All told, though, this was a fun read. I like these Annwn books when they’re not being overtly hostile to the Irish. I particularly like that these books take place from the point of view of the people of Annwn. They aren’t the story of some human explorer who finds him- or herself on this wacky planet where magic happens, like you’d probably expect. Instead they’re the story of the people on this planet who occasionally have to deal with the weird people who come from this “Earth” place and raise a bunch of ruckus. It’s a neat inversion of most science fiction in that vein, and I approve of it.